Republican governors campaign on executive experience in New Hampshire: Do Republicans really think governors make better presidents? Do Republicans really think governors make better presidents? Former Florida Gov. Jeb Bush, left; Wisconsin Gov. Scott Walker, center; and New Jersey Gov. Chris Christie, right. Coverage of the first gathering of Republican presidential candidates in New Hampshire last weekend focused on how many of them attacked Hillary Clinton, but there was another unifying message among several of the speakers: Governor is greater than senator. Govs. 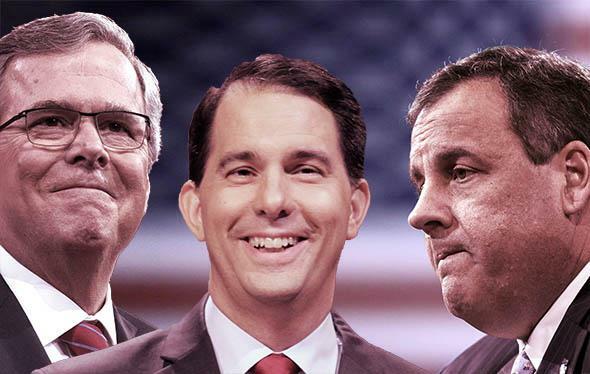 Scott Walker, Rick Perry, Chris Christie, and former Florida Gov. Jeb Bush will turn to fileting each other soon enough, but for the moment, these statehouse men are all making the same case. Each candidate, sometimes in nearly identical language, told the audience of activists gathered in Nashua this weekend that they should be considered for the presidency because they didn’t just talk about conservative ideas, they had put them into practice as governors. The next president of the United States really needs to be someone who has deep experience as an executive. And I’m talking about things you just can’t learn with a book, things you can’t just learn sitting down. Because I’ll give you some examples. They didn’t hand me a manual say, “Here’s how you deal with a space shuttle disintegrating in your state.” They didn’t hand me a manual when Katrina came into Louisiana and there were literally hundreds of thousands of people that were displaced. They didn’t hand me a manual when all those people showed up on our borders last year. Or for that matter when Ebola ended up on the shores of America in Dallas, Texas … we need to have this conversation and talk about it in a civil and a thoughtful way, that that executive experience is incredibly important for the next leader of this country. Because we’ve spent eight years with a young, inexperienced United States senator. And I will suggest to you economically, militarily, foreign-policy wise, we paid a tremendous price. The idea connected with the audience. On Saturday morning, pollster Frank Luntz held a focus group with about 150 Republican activists. He asked the room whether they’d like to see a senator as president, and about five people raised their hands. He asked the same question about selecting a governor, and everyone in the room seemed to raise their hand. “Wow,” said Luntz. The polling shows this, too. As Aaron Blake wrote in the Washington Post, a new CNN poll shows that when voters are asked which candidates have the right experience for the job, the governors come out far ahead. A Pew poll a year ago showed that by 51 percent to 40 percent, Republicans preferred a governor to a senator, a 19-point increase since that question was asked in 2007. There are plenty of reasons this might be the case. Governors make decisions, which is what a president must do. Senators mostly talk, which means when they are demonstrating excellence in their field they are displaying qualities similar to Barack Obama, who is obviously not well-liked among conservatives. Also, the senators are all young and in their first term, and as Perry pointed out, Republicans have spent a lot of time pointing to Obama’s lack of executive experience and slim Senate record as proof of the flawed concept of electing that kind of fellow. Also, senators are from Washington, which is unpopular, and governors are from everywhere else. That doesn’t mean that the senators need to fold up their tent. When I talked to some of those same activists who raised their hands at Luntz’s focus group about their favorite candidates, Sens. Cruz, Rubio, and Rand Paul were well-represented in the bosom of their affections. They were attracted to them because they spoke the truth, seemed likeable, and shared their ideological views. So in the end, what GOP voters may be telling us with this preference for a governor is not what they really think about when they vote, but what they don’t think about. Their strong opinions about presidential attributes just don’t govern their electoral choices, as much as they might like to think a candidate’s experience is important to their success in the job. (And as much as that might be a rational way to go about things, given how often campaigns are compared to job interviews.) Despite the years of complaining that the country was hoodwinked into picking a president who had never run anything, GOP voters will probably act like the voters who have come before them in both parties.